Toddler mealtime is soooo different from a baby’s. Your child is now more independent and listens a little bit better to rules and directions. 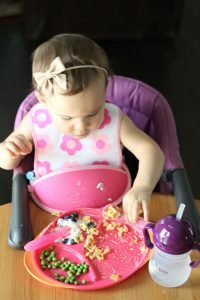 I want to share our ultimate toddler meal time must haves for home and on the go! Get excited these are some amazing and fun products! 1. Silverware: Your toddler is feeding themselves by now so you need silverware that will support that. There are two companies that provide some great products for this. B.box has numerous ones to chose from so check them all out! 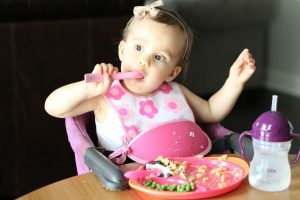 We really love the soft and flexible silicone spoon for scooping her favorite mac n cheese. 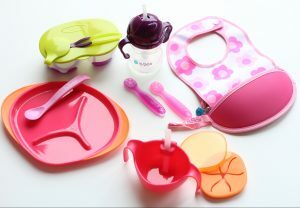 The spoons are BPA, phthalates and PVC free. 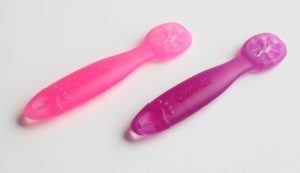 We also really love the Choomee silicone starter spoon which is also BPA, PVC, phthalate and lead free. Both spoons are very flexible, which I really love because Izzy can also chomp on them as she works on her molars. 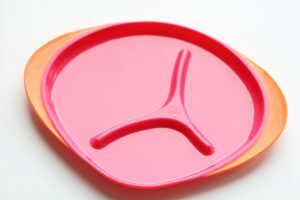 We love the Choomee spoon for food that is harder to scoop and are likely to slip off a spoon such as yogurt, grits and thick stew. Grits are so messy! It was a relief to see Izzy easily eat grits independently, when we were out to breakfast. Guys, instead of feeding her, I could actually eat my food! 2. 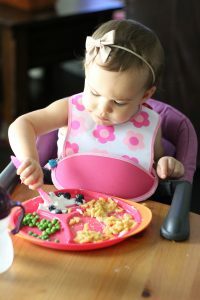 Bibs: Now that they are feeding themselves with silverware they need a bib to not only protect their clothes, but catch the spillage. 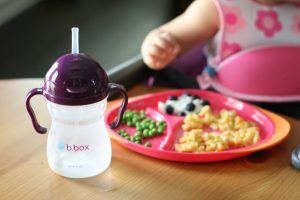 B.box makes an incredible bib and it has a pouch which catches the food missed by their mouth. 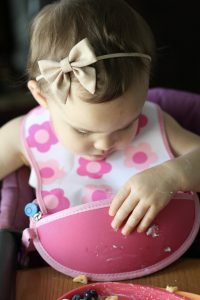 So as Izzy flipped her spoon too soon and the macaroni fell, it landed in her bib. Less mess on the floor & her lap and more food saved to actually eat and try again. There is another reason I love this bib. 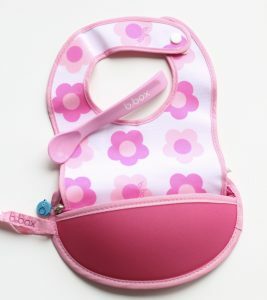 It rolls up into the pouch and zips shut making it a clean and easy travel bib. Checking for her mac n cheese. 3. Plates and Containers: What are you serving food on or in? Whether you are on the go or at home B.box has some seriously amazing products! The plate they make we love because it has dividers, a non slip base and it’s dishwasher safe. As for the unique bowl and straw product.. um amazing! 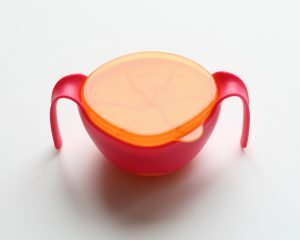 It has three options, attach the straw & clip, put on a snack lid or the storage lid. 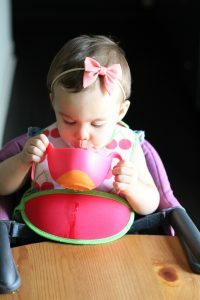 I love that the no slip bottom keeps it in place while Izzy eats at the table. Our favorite use for it is when we are out to eat and she has a fruit cocktail. The fruit can be eaten out and the juice she can drink out with the straw! 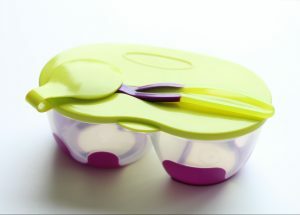 Lastly, the snack pack is perfect for travel because it even comes with a spoon attached to the lid! 4. 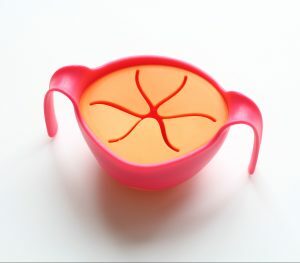 Drink Time: Keep your baby hydrated with a spill proof cup perfect for home or on the go. There is no question why this is an award winning cup! It’s by far our favorite cup for Izzy. Guys, I’m seriously obsessed with these products and wouldn’t share them with you if I wasn’t. You really will LOVE them too so check them out! Izzy’s adorable bow is from Wild Clover Baby and Child. Love those containers with the straw! Great roundup! Yes! Giveaway later today on Instagram also! So cute! I’m going to have to find those choomee spoons!! So many great items! I don’t have much experience with b.box but I absolutely love that bowl! 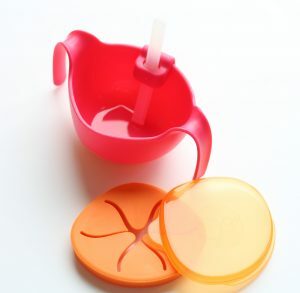 Love the bowl/straw product for fruit cocktail! These are REALLY cool products. Like, I’m for real going to check them out! Oh I just love this stuff! It’s perfect for toddlers and so cute! I love the color options they have ? Bibs are must haves for our meals hahaha because my little one is scary messy hahaha ❤️❤️❤️❤️ And love all those products!!!!!! Yes meal time gets wild lol ? 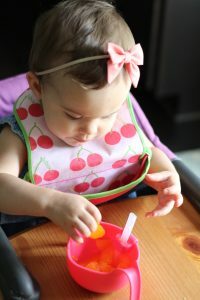 Pocket bibs are a must have for mealtime at our house and are also amazing when we go to restaurants and don’t have a highchair tray, our little one just eats her finger foods out of them. We’ve never tried this kind, but we’re going to have to check them out! Also, our floor mat for easy clean up of any pieces that happen to get past the bib pocket. All of these look great! i need to check some of them out! Yes, they are amazing products ? These are all such great products!! But I am most interested in the bowl with the straw. Sounds like a life saver!! Omg it’s the most amazing! I want to try those ChooMe spoons! I think that would help our daughter so much. She is so independent but she’s not always able to do everything herself. All of these products look amazing! Thank you! Yes the ChooMee spoons are great!